The end of foreign and civil war and the retreat from war communism since 1921 helped to ease, though slowly, the worst effects of the economic catastrophe. Then after a 5-year period of rehabilitation, Soviet agriculture and industry were approaching the prewar level, and in the second half of the 1920's a main problem of the regime were the issues involved in the further development of the Soviet economy. The Soviet government embarked on a policy of rapid industrialization of the country; detailed plans for economic growth were elaborated in the late 1920's, for 5-year periods. A 5-year plan contained the projected rise of industrial and agricultural production in specific figures for every year. As far as Soviet industry was concerned, two great issues, political rather than purely economic, had to be resolved. The first was the scope and pace of industrial development. Poor in capital even before the revolution, having suffered great destruction since 1914, and with no prospects of foreign loans, Soviet industrial growth was possible only at the expense of the standard of living of the people, and in a country where three-fourths of the population were peasants, industrialization could proceed only at the expense of the wellbeing of the poverty-stricken peasantry. Given the situation in which the Soviet regime found itself in the 1920s, the only important source from which an industrialization fund could be accumulated was the peasantry. Long-term foreign loans, the historical instrument of industrial development in backward countries, were not available. The concessions policy of the Soviet regime met almost complete frustration. The only remaining alternative was aptly described by V.M.Smirnov and E.A.Preobrazhensky as "primitive socialist accumulation," the diversion of the output of the peasantry and the private sector of the economy to finance investment in socialized heavy industry. While one faction of the ruling party, the Trotskyites, were strongly in favor of accelerating the pace of industrialization despite the hardship this would place on the peasantry, the majority of the party's leading bodies, that is, the Stalin-Bukharin coalition, at first rejected such a program as a threat to the stability of the Soviet system. In 1928-29, however, when Stalin broke with the right opposition (Bukharin, Tomski, Rykov), and the Trotskyites had already been crushed, he embraced the latter's industrial program in its most extreme form. The pace of industrialization was greatly accelerated, and the goal of completing "the first 5-year plan in 4 years" was proclaimed. The scope of industrial construction was greatly enlarged. The burden of industrial expansion was becoming almost insupportable and strong resentment developed in the party. Stalin, however, did not retreat. "It is sometimes asked [he said] whether it is not possible to slow down the tempo somewhat, to put a check on the movement. No, comrades, it is not possible! The tempo must not be reduced! On the contrary, we must increase it as much as is within our powers and possibilities. This is dictated to us by our obligations to the workers and peasants of the U.S.S.R. This is dictated to us by our obligations to the working class of the whole world. "In the past we had no fatherland, nor could we have had one. But now that we have overthrown capitalism and power is in our hands, in the hands of the people, we have a fatherland, and we will uphold its independence. Do you want our socialist fatherland to be beaten and to lose its independence? If you do not want this, you must put an end to its backwardness in the shortest possible time and develop a genuine Bolshevik tempo in building up its socialist economy. There is no other way. That is why Lenin said on the eve of the October Revolution: "Either perish, or overtake and outstrip the advanced capitalist countries. "We are fifty or a hundred years behind the advanced countries. We must make good this distance in ten years. Either we do it, or we shall go under. " The second political issue of the era of industrialization was the goal and direction of the industrialization: which industries should have priority and which could be relegated to second or third place. If the well-being of the people were the primary objective, then textiles, the leather industry and housing should have priority; but if war industries and the prerequisites for rearmament were to be pushed, then so-called heavy industry must have priority. 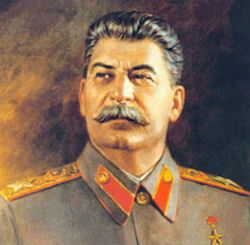 In a fight with the "right opposition," Stalin argued for the latter course. We did not have the steel industry, the basis of the country's industrialization. We now have it. We did not have a tractor industry. We now have it. We did not have the automotive industry. We now have it. We did not have the machine tool. We now have it. We did not have a serious and modern chemical industry. We now have it. We had no real and serious industry for the production of modern agricultural machinery. We now have it. We did not have the aircraft industry. We now have it. In terms of production of electric power we were last on the list. Now we rank among the first. In terms of coal and the production of petroleum products, we were in last place. Now we rank among the first. We had only one single coal and metallurgical base - in the Ukraine, with which we are struggling to cope. We have ensured that not only in improving this base, but have created a new coal and metallurgical base - in the East, is the pride of our country. We had only one single textile industry base - in the north of our country. We have ensured that we will have in the near future, two new base of textile industry - in Central Asia and Western Siberia. And we have not only created these new huge industry, but we created them on a scale and in such dimensions that eclipse the scale and dimensions of European industry. "Heavy industry" became a cover for war industry; in particular, Soviet "machine-building" embraced the production of arms. Except for some confusing figures about machine-building combined with production of tanks, military trucks, etc., no statistical or other details of Soviet "machine-building" were published. In the five-year plans of production of means of production there is also included the war industry, production of means of mass destruction and of annihilation of people. "It is true that the output of goods for mass consumption was less than the amount required, and this creates certain difficulties. But, then, we must realise and take into account where such a policy of relegating the task of industrialisation to the background would have led us. Of course, out of the 1,500 million rubles in foreign currency that we spent during this period on equipment for our heavy industries, we could have set aside a half for importing cotton, hides, wool, rubber, etc. Then we would now have more cotton fabrics, shoes and clothing. But we would not have a tractor industry or an automobile industry; we would not have anything like a big iron and steel industry; we would not have metal for the manufacture of machinery — and we would remain unarmed while encircled by capitalist countries armed with modern technique. Finally, the Party had to put an end, in the shortest possible space of time, to the weakness of the country in the sphere of defence. The conditions prevailing at the time, the growth of armaments in the capitalist countries, the collapse of the idea of disarmament, the hatred of the international bourgeoisie for the U.S.S.R. — all this impelled the Party to accelerate the work of strengthening the defence capacity of the country, the basis of her independence."